Companies can support WRI's mission in several ways, including cause marketing, matching gift programs, and in-kind donations. WRI would like to identify a cause-marketing opportunity with a company whose products and mission align closely with ours. To propose an opportunity or brainstorm a cause-marketing idea with us, please contact Chris Perceval. Matching Gift Programs are an effective way for organizations to demonstrate their commitment to philanthropy to their employees. If your company already has a program in place, you could ensure that WRI is included on its list of eligible non-profits. Check with your company's human resources or payroll department to see whether it offers a matching gift program. The information below should assist your company in including WRI in its Matching Gifts program. If you need more information or are interested in speaking with someone at WRI about the process, please contact Andreea Culian. Companies can make in-kind contributions to WRI, in the form of equipment, services, software licenses, etc. See below for short explanations of some of WRI’s current corporate in-kind support. As one of Footage of the World’s non-profit partners, WRI receives free access to the company’s stock video footage, for use in publicizing our work. The Access Initiative (TAI), a WRI-led global network that works with partners in 50 countries on complex environmental governance issues, has taken advantage of this benefit. In the past TAI has found it challenging to find pictures and videos to visually represent the importance of its work. However, with the free stock footage that Footage of the World provides for us, WRI was able to create its first TAI introductory video.The footage we used helped capture the true essence of TAI’s work and the importance of implementing principles of environmental governance in protecting the world’s natural resources. In 2009, Bloomberg L.P. supported the Markets and Enterprise Program (MEP) at WRI through the generous donation of access to the Bloomberg Professional Service. With access to this service, MEP was able to set up a dedicated terminal where WRI staff can access the immense amount of real-time and historical financial information available on the Bloomberg Professional network. MEP and other programs at WRI have used this service to provide a financial context to their research, as well as develop new thinking on how to communicate environmental issues to businesses, investors, and other audiences. For ten years, IBM has made annual contributions of desktop and laptop computers to WRI’s Headquarters in Washington, D.C. Since 2000, IBM has donated over 100 computers, which help ensure our staff has up-to-date equipment to assist them in their work. WRI has a long-standing commitment to reduce the environmental footprint that results from its activities, and this commitment extends to our meetings and special events. At our 25th Anniversary Dinner in 2007, Brown-Forman, for example, provided award-winning, organic Bonterra Vineyards wines for the 600-person event. Starbucks Coffee Company provided organic shade grown coffee. 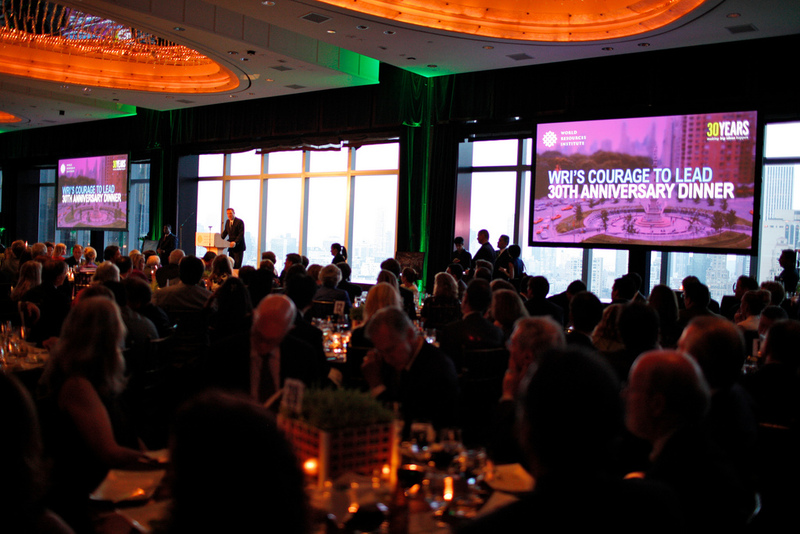 Starbucks provided organic coffee again in 2009 for our 400-person Courage to Lead Dinner in New York. In 2007, NBC created and produced a video about WRI especially for our 25th Anniversary Dinner. In 2009, Ogilvy & Mather produced two four-minute tribute videos for our 2009 Courage to Lead Dinner. The superbly produced videos by NBC and Ogilvy conveyed inspiring messages and stories and helped make each event a great success.